The Agha Shahid Ali Prize in Poetry was inaugurated in 2003 to honor the late poet, a nationally recognized author of numerous collections of poetry and a former professor at the University of Utah, and is sponsored by the University of Utah Press and the University of Utah Department of English. 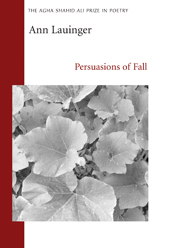 In Persuasion of Fall, the first prizewinning volume of the annual competition, Ann Lauinger celebrates the quotidian in ways that are wise, uncompromising, and sometimes sly in their playfulness. Ann Lauinger is on the literature faculty at Sarah Lawrence College. Her poems have appeared in such journals as The Missouri Review, Parnassus: Poetry in Review, and Rattapallax. She is winner of the 2002 Erskine J. Poetry Prize from Smartish Pace.